The cosine power filter allow to apply a convolution with a cosine power (can be call Phong) lobe on the cubemap. There is two methods to generate cosine power values for each PMREM’s mipmaps. Drop and Mipmap. The one to choose depends on you and your engine. With the value power drop on mip you can control how fast the cosine power use for convolving each mipmap of the cubemap is decreasing. The radiance come from the fact that cubemap texel store radiance (the incoming lighting). – Load the base cubemap you want to process ( The loaded cubemap should be HDR (and so in linear space) for best result). – Chose an output cube texture resolution, we will use 128. – Chose cosine power filter as filter type. – Set a value in cosine power edit box. This value will represent the maximum specular power (cosine power and specular power are same thing) you allow for material interacting with this PMREM. We will use 2048 here. – Chose a power drop on mip, we will use 0.25. – Click on filter cubemap. 2048; 512; 128; 32; 8; 2; 0.5; 0.125. The left cross is the loaded cubemap, other are the PMREM, only 5 mipmaps are displayed due to their size (and cubemapgen badly export such crossmap). There is several way to use such a PMREM in a shader, here I will present you one but remember that you can do as you want. MaximunSpecularPower is the value set in cosine power edit box. PowerDropOnMip is the value set in power drop on mip. SpecularPower is the specular power of the material evaluated in the shader. This match our constraint well. Disclaimer: Log(0) is undefined. You may want to add an epsilon to avoid this case. This will generate a high MipmapIndex for 0 but this will still correct as the mipmap sampled can’t be greater than number of mipmap (n). In this mode, the cosine power value and its decrease are control by NumMipmap, Gloss scale and Gloss bias values. Gloss scale and Gloss bias refer to two parameters commonly used when decompressing gloss value to specular power in game engine (See Adopting a physically based shading model for an example). 2048; 512; 128; 32; 8; 2. There is several way to generate the PMREM. Default Cubemapgen behavior is to process the current mipmap with the previous mipmap as input. I made an exception for the cosine power filter which always use the base cubemap as input. This improve the quality but slow the process. When enabled, this option will not modify the base mipmap of the PMREM. Mean you have no filtering applyed. But others mipmaps still convolve normally with the right specular power. Lighting model selection should be used when modified Cubemapgen use cosine power filter and the choice depends on your game lighting equation. If you used a normalized Phong lighting in your game, i.e , chose Phong. If you use a normalized Phong BRDF lighting in your game , i.e you should chose Phong BRDF. Same for Blinn and Blinn BRDF. For more details on physically based lighting model check Adopting a physically based shading model. To understand the disappear of in following code see PI or not to PI in game lighting equation. Actually, for performance reason, only Phong highlight shape can be prefiltered in cubemapgen. The Blinn lighting model is approximate by fitting its highlight shape to a Phong highlight shape. The fitting process is just a modification of the cosine power at the filtering step. Note that you will not be able to match the elongated highlight shape the Blinn lighting model can provide at grazing angle, the fitting only concern the size of the spot highlight shape. Other BRDF can’t be represented with PMREM generated by Cubemapgen. A cosine power of 0 with a cosine power filter and Phong BRDF will produce an irradiance cubemap. A cosine power of 1 with a cosine power filter and Phong will produce an irradiance cubemap. Even if result are subtils, Warp and Bent always perform better or equal than old edge fixup method and don’t depends on Width. It is recommanded to not used old AMD Cubemapgen edge fixup method anymore. Result of strecht method is not show here. The stretch method purpose is to be used with a specific shader code which allow to fix the seams at runtime as describe by Ignacio Castaño in  . Reader should refer to the article for details. If the shader code is not used, the result is less good than with the Warp or Bent method. Sadly, this code require many instructions: max, exp2, sne, mad, lots of mul and mov representing 4 cycles on PS3. The shader code work well with the Warp method too. To know the output radiance at a given point, we must compute this integral. If the object is perfectly specular (a mirror), a single texel of the cubemap will be required to lit the point. However for glossy or diffuse object, a lot more texels are required. This is a computationally intensive process. To speed the runtime evaluation, we precompute the integral above and store the result in a cubemap. If we use a Lambertian BRDF for , we get an irradiance environment map. If we use a Phong or Phong BRDF, we get a PMREM. A PMREM store the reflected light instead of the incoming radiance and is defined for one particular glossiness value. and apply other part of the BRDF (if any, like Fresnel, visibility term) at runtime. Remark that I apply the normalized Phong BRDF as a sample, but you can use normalized Phong depends on your game lighting equation. The new features added to Cubemapgen allow to generate such a PMREM. The Phong BRDF option allows to specify if you want used a Phong BRDF of just a Phong as lobe shape. Cubemapgen will apply the normalized factor of Phong or Phong BRDF automatically at the PMREM generation, so you don’t need to apply them at runtime. It is usual in a game to approximate distant diffuse lighting with an irradiance environment map. This subject has been covered by many and will not be discuss here. The common speed-up today to perform an irradiance environment map is to capture a cubemap, project it in spherical harmonic (SH), apply the cosine convolution then recreate a cubemap from the SH coefficient. This was describe first in . A Gpu approach is also describe in . Cubemapgen apply the energy conserving factor linked to the filter type in the cubemap result. This mean that for irradiance cubemap you don’t need to divide irradiance to radiance (The factor ) and for prefiltered radiance environment map you don’t need to deal with the or factor. Source code for this modified Cubemapgen are submit on the google code repository http://code.google.com/p/cubemapgen/ which can be browse online. All changed from the original source code are tagged with BEGIN / END. As seeing code often help to the understanding of features, here is some implementation details. * This formula is from Manne Öhrström's thesis. * surface of the sphere. //scale up to [-1, 1] range (inclusive), offset by 0.5 to point to texel center. // U and V are the -1..1 texture coordinate on the current face. Detailed derivation of this result by Rory Driscoll can be found here . (a_MCO.LightingModel == CP_LIGHTINGMODEL_BLINN || a_MCO.LightingModel == CP_LIGHTINGMODEL_BLINN_BRDF) ? // Here we decide if we use a Phong or a Phong BRDF. // so just adding one to specularpower do the trick. The IsPhongBRDF is defined to 1 when PhongBRDF or BlinnBRDF option is enabled and 0 else. As you can see, the added dot(N, L) is factored in the pow. Normally, we should go through half texels of the cubemap, as describe by the integral in theory section, to compute a value (Base Filter Angle of 180). To speed up the process I calc a BaseFilterAngle based on the specular power which allow to discard insignificant part (Thanks to Ignacio Castaño again for this optimized version). But with very high value in the HDR cubemap, this can bias the result. 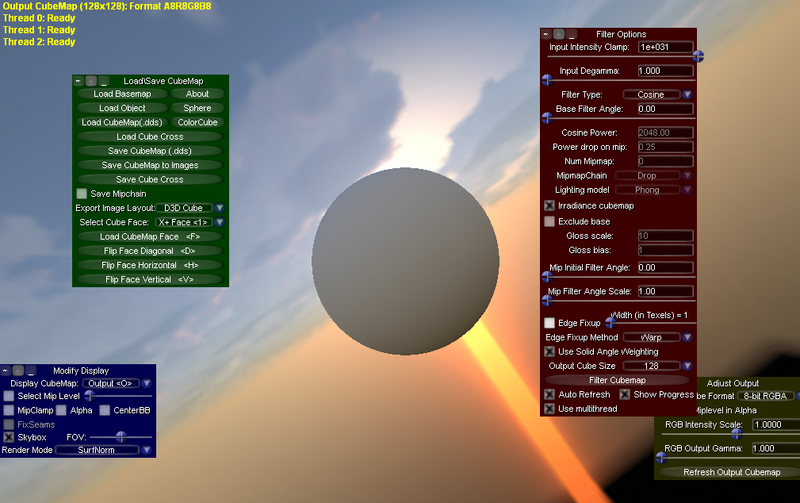 For irradiance cubemap I use spherical harmonics(SH) order 5 which mean 25 coefficients. SH order 3 on my test can introduce little error with some HDR cubemaps. The normalization factor to apply is calculated numerically in Cubemapgen. Derivation of this result can be found in . As you can see, when we calculate an irradiance cubemap, we divide the result by PI, which is what we expect. Each numerical integration for Phong and Phong BRDF will match the analytic integration we done to calculate the energy conserving factor of Phong or Phong BRDF : and . Derivation of this result can be found in . So Cubemapgen is energy conserving at the source! The Bent edge fixup is my interpretation of the work done by TriAce research . The algorithm is describe on slide titled “Bent Phong Filter Kernel”. The slides are actually in Japanese but an english version is available on the TriAce’s web site. The goal here is not to blend color like in classic AMD edge fixup but to blend normal instead. Warp do this too and this is why these two new methods provide better results. The algorithm defined an offset angle which will be used to bent the vector from cubemap center to texel center away from the face normal. To get the offset angle, we define a target angle as the angle between the vector from cubemap center to face edge and vector from cubemap center to edge texel . The offset angle is the value linearly interpolate from 0 to target angle based on distance from cubemap center. This allow to have stronger effect at edge and no effect near cubemap center. There is some tweak added to reduced the contribution of the target angle based on cubemap resolution. I chose to perform this code on texel coordinate rather than change normal later like the Warp method. However contrary to Warp, Bent perform a linear interpolation in spherical domain. // Get angle between face normal and current normal. Used to push the normal away from face normal. The Stretch edge fixup method of ModifiedCubemapgen is based on NVTT implementation . // transform from [0..res - 1] to [-1 .. 1], match up edges exactly. The last 1x1x6 mipmap of the mipmap chain is the average of the 6 face in both method. thanks for this great series of posts about PBR and for sharing your CubeMapGen updates. Looking at the sources, there’s one thing I’m wondering about. The cosine power filter is only applied to the top mip and a regular cosine filter is used for the subsequent levels. There is an option CosinePowerOnMipmapChain but it does not seem to do anything. Is there a specific reason for that behavior? You right about the cosinus power applyed only on top mip. To be useful, the whole mipmap chain should use a cosinus power filter. First, I planed to update CubeMapGen with a cosinus power mipmap chain generation option like what I do in my project (see previous post). This is what you read in the source code but I remove the implementation. The reasons is that I wanted to test different ways of generating the mipmap chain (like the Tri-Ace method) and compare quality before delivering it in CubeMapGen. I will definitely add this option in a future update, I only miss time for now :). I update the post to version 1.65. Two new edge fixup method are discuss and PhongBRDF checkbox has been replaced by lighting model combobox. All this is discuss in new section call edge fixup (in usage and implementation) and Phong/Blinn (in usage, theory and implementation). Thanks for your great posts about PBR. I’m implementing PBR as your implementations. And edge fixups work well, but at first It seemed that they didn’t work. The reason was DXT Compression. DXT Compression reintroduce seams. I wonder whether you met same problem. The code to fix DXT compression has been removed from the provided AMD code. It need to be reimplemented (I will maybe take a look at it in the future). then reexport it to DXT1 compressed dds file. – a new method to calculate the specular power used for convolution of PMREM’s mipmaps call “Mipmap”. The previous method is now call “Drop”. ps: remember me looks pretty awesome! I am not sure what you mean by “much more than it’s supposed” but as this is a fork of AMD Cubemapgen, I am not aware of every piece of code. Thanks for the quick reply! Good news. I guess my firewall just went crazy yesterday night. 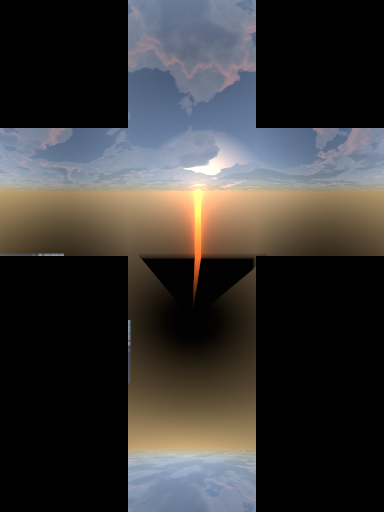 After playing around with the CubeMapper I couldn’t figure out how to convert a spherical light probe HDR texture into a horizinal cross cubemap. It looks like CubeMapper should be able to do this, but I can only load an HDR-lightprobe as “base texture”. Also, is there way to sample from HDR-Cubemap to DDS-Cubemap without filtering? 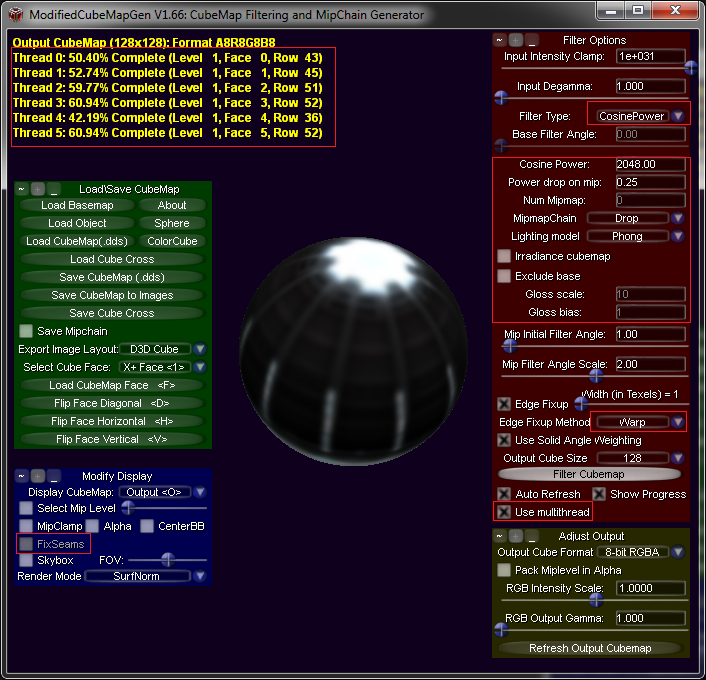 > how to convert a spherical light probe HDR texture into a horizinal cross cubemap. You should use HDRshop for this, cubemapgen can’t. “To convert” you mean ? Yes, load the HDR texture then save the ouput without doing any filtering, cubemapgen will ask a question, say yes. HDRShop looks soo… ahem… old school. But thanks for the tip! Im trying to export dds and I need the mips on it. After opening the exported dds in photoshop I see there isnt any mip. Whats the workflow for this? Hey, did you try to Check the mip map chain checkbox before to export ? Do you have a better method? Yes,do not use “Save cubemap to images” then select .dds file type. Use the “save cubemaps (.dds)” button instead (with save mipmap chain checked). I also suggest to use DDSView : http://www.amnoid.de/ddsview/ to easyli see a cubemap cross and vizualising mipmap of a dds. I see, that works, but we have one more problem, I need separate images I guess I could use gimp again. is there any chance to output this fixed seams into the textures? The edge fixup stretch from Ignacio Castaño ? It seems it is not possible. Thanks for this nice implementation to the cubemap gen. I am using it right now to convolve some hdr maps for use as cube map inside Mari, in new custom shaders that I am writing. Would be nice if you could implement the Cook-Torrance brdf and Ashikhman-Shirley BRDF to this version of the cubemap gen. Thanks. I was thinking about upgrading cubemapgen for other BRDF but never took the time to do it and not sure if I will do it in the future (but this would be nice to have). If you want to do it by yourself you should implement it with importance sampling, the code for a GGX BRDF is provided in Brian Karis Siggraph 2013 talk : http://blog.selfshadow.com/publications/s2013-shading-course/. First of all thanks for the tool, very handy indeed! I’ve a problem though, I’ve noticed something a tad off when computing the irradiance map for one of my cubemaps, so I decided to try to use the reference posted on this site and it is different from the result you posted here. In particular the result I get is the following: http://imgur.com/YlZxS3Y . This is the result with both the fast Irradiance Map option and with cosine 180°. Am I missing something? Can you provide more details on what option you chose (a screenshot of the option could be more simple) and which cubemap on this site you use to generate the screenshot you send ? Be sure to check the BRDF option you use, Phong or Blinn, the result will be different. Here is the screenshot for the options: http://i.imgur.com/JwfIMJE.png and the cubemap I’m using is https://seblagarde.files.wordpress.com/2011/09/skybeamref.png . So yeah, nothing weird here. What you have done is that you have download the image from my website and process it in cubemapgen. This can’t give you the same result as me. In my case I have use the texture provide in original ATI cubemapgen named SkyBeamHDR512.dds (in the directory /Texture/Cubemaps). I chose it for my test because it was one of the only true HDR cubemap of the package. Once processed I have save the result in RGBA8 with a gamma 2.2 for displaying it on my blog. Remember that you have multiple output format with gamma control in cubemapgen. If I take the image directly from my website and process it, I get the same result than you, a non HDR no gamma corrected image. Hello, one thing that caught me was that in the simplified mip map index function (-1.66096404744368 * log(SpecularPower) + 5.5;) the log() must be a base 10 log. Using the built in shader log() (natural base) would require a multiplier of -0.72134752. It looks like the FP16 denormal handling when converting back to FP32 is creating a denormalized FP32 incorrectly. I’m fixing it locally but I can send you the change if you like (it’s pretty small). Sure sens it to me it post the change here, i will update it. Thx! Here it is… feel free to swap out the clz implementation if an appropriate intrinsic is available! Thanks, I update the code with this simpler ref implementation: https://gist.github.com/castano/2150795 and add support for the mantissa == 0 and exponent == 0 case. On GPU’s bad with branching, maybe this will be faster? it is indeed cleaner code and yeah better to write it like that but it may not be faster (and in some case even slower on scalar GPU). if often converted converted to a conditional mask on some GPU, like CndMsk(abs(WorldSpaceReflectionVector.x) != M, WorldSpaceReflectionVector.x * scale, WorldSpaceReflectionVector.x). Hi first of all thank you for this tool and the many excellent articles/posts you have posted here over the years. I was wondering if there’s any way I can use this tool to batch process cubemaps? Yes you can. Like the original Cubemapgen you can call ModifiedCubemapgen within command line or embed in code. any document for the usage of the exe cmd line? where did you get the example?? Hey. This tool is from AMD they have provided documentation long time ago on their website . Don’t know if it still available. Quite useful article, I’m exporting your code from Google code to GitHub, https://github.com/FatGarfieldjteng/cubemapgen, because Google is blocked in my country. Have to access this project from Github. If not proper, I’ll remove this GitHub project. Hey, thanks for doing this. I want to thank you a lot for this post. I’m an amateur, a hobbyist, and using your modified cubemapgen and the information in this post, I was able to get satisfactory global illumination working. One thing that confuses me, that I’m curious about, is your choice of default specular powers. Using an unormalized Blinn specular, the vast majority of my specular powers lie in the 1-4 range, which with a 0.25 drop is contained inside a single mipmap– a tiny one at that, when using a 2048 power base with a 128px cube. Even with a 64 base, 0.5 drop, 256px cube, my SP2 looks boxy. Likewise, I don’t tend to care much about specular powers >50; they might as well all be perfect reflections for how little difference exists between them, with any remaining differences easily communicated by trading tiny bits of specular for diffuse. It seems to me that a different mapping of miplevel to specular power would give me more resolution where it matters most. I’m curious as to the choices of these actual specular powers. Am I doing something wrong? Is this choice of log4(SP) mapping motivated primarily by ease/speed of figuring out the appropriate miplevel in the shader? In batch mode on Windows 8.1 the program does not shut down properly, leaving my calling application unable to figure out if MCG is still working, already done, or even crashed. It’s pretty much the same when running it via simple UI start. After closing MCG, there still stays at least on thread of the program active in the background. Quite easily to be viewed by the Task Manager. I’ve tried to build MCG myself, but lacking D3D9SDK which cannot be installed anymore, I’m at a loss. Any ideas how to get over this problem? My graphicians would really like to have the tool implemented in their workflow. your article is really helpful and I used your method to create specular cubemaps. They are accessed with texCubelod in my shader. If I want to use this cubemap for materials that have a mirror-like glossiness of 1.0 (roughness 0.0), the texture starts flickering in the distance. I assume this is because texcubelod does always address the same given mipmap-level at any glancing angle or distance, where normally smaller mips would be addressed. Is there a way to get rid of the flickering when using texcubelod? texCUBElod is used to force which MIP level your shader will fetch. texCUBE will compute the appropriate MIP and fetch from it.